About "Writing equations using the area of a trapezoid"
Here we are going to see how to use equations to solve problems based on the shape trapezium. 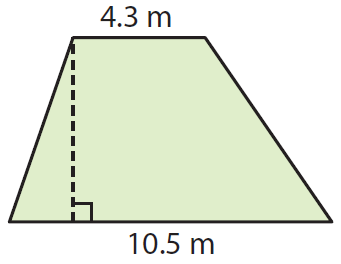 Write the formula to find the area of trapezoid. A garden in the shape of a trapezoid has an area of 44.4 square meters. One base is 4.3 meters long and the other base is 10.5 meters long. The height of the trapezoid is the width of the garden. How wide is the garden? The cross section of a water trough is shaped like a trapezoid. The bases of the trapezoid are 18 feet and 8 feet long. It has an area of 52 square feet.What is the height of the cross section? The top of a desk is shaped like a trapezoid. 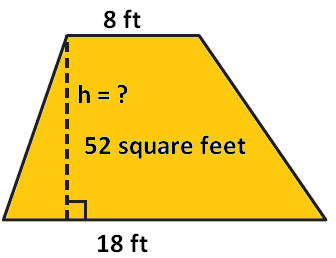 The bases of the trapezoid are 26.5 and 30 centimeters long. The area of the desk is 791 square centimeters. The height of the trapezoid is the width of the desk. Write and solve an equation to find the width of the desk. A section in a stained glass window is shaped like a trapezoid. The top base is 4 centimeters and the bottom base is 2.5 centimeters long. If the area of the section of glass is 3.9 square centimeters, how tall is the section? After having gone through the stuff given above, we hope that the students would have understood "Writing equations using the area of a trapezoid".